Quantitative easing increases the money supply, creates inflation and devalues the currency. Inflation is a hidden tax. Quantitative easing is nothing more than stealing from the people. Economists have another term to describe the monetization of government debt (=Quantitative easing). The history of “seigniorage” goes back to the debasement of the coinage under the Roman emperors. Seigniorage is really a tax on holders of money and government debt which is paid via inflation. When carried to excess, it leads to hyperinflation. Prepare for the worst, because it’s coming! There’s been nothing like it since the wolf dressed up as grandma in order to turn Little Red Riding Hood into pot-roast. Gordon Brown now claims to be a champion of the middle classes. Apparently, only he can be trusted to look after their interests. And there were millions of us thinking that he was, in fact, the unreconstructed arch-enemy of the middle classes and of everything they hold dear. UK inflation jumped the most on record in December, fuelling fears that interest rates will have to rise sooner rather than later to keep prices in check. The sharp rise in the annual rate of consumer price inflation from 1.9pc to 2.9pc was driven by exceptional events in December 2008, as the VAT cut and high street discounting at that point were not repeated last month. An increase in the price of petrol and new cars also drove the Consumer Prices Index (CPI) up last month, the Office for National Statistics said. Economists had expected a smaller rise in CPI to 2.6pc. Howard Archer, chief UK economist at IHS Global Insight described the data as “a very nasty shock”. It was the first time since May that inflation has risen above the Bank of England’s 2pc target, and economists predict inflation will rise above 3pc this month, reflecting the reversal of the VAT cut on January 1. At that point Mervyn King, the Bank’s Governor, would be required to write a letter to the Chancellor, explaining why inflation was more than a percentage point above the target. It comes at a difficult time for Britain’s consumers, who face the prospect of rising taxes, rising interest rates, and spending cuts as a fragile economic gets underway following the worst post-war recession. The retail prices index (RPI) – which includes housing costs – rose even more sharply, to 2.4pc from 0.3pc in November. Inflation in Britain has remained consistently higher than other countries during the recession, which economists partly attribute to the pound’s weakness, which has driven up the cost of foreign goods. The staggering one percentage point jump in CPI in December was the biggest since monthly records began in 1997, and presents the Bank’s Monetary Policy Committee (MPC) with a dilemma, as it weighs up the need to maintain support for the economy with the threat of inflation. “This morning’s release of December’s UK inflation numbers will have sent the Bank of England’s MPC and Governor Mervyn King, into something of an unseemly tailspin,” said Nick Beecroft, senior FX consultant at Saxo Bank. A temporary spike in inflation has been expected, partly because of the VAT rate change, and the MPC has maintained that it would look beyond it to the prospects for medium-term inflation. In its November Inflation Report the Bank expected CPI to fall below the target later this year, as the effects of the VAT change are stripped out and wage inflation remains subdued. However, economists pointed to the unexpectedly sharp rise inflation rise in December. “Today’s data will raise fears that the spare capacity in the economy will not tame inflation,” said Colin Ellis, European economist at Daiwa Capital Markets Europe. Jonathan Loynes, chief European economist at Capital Economics, said the increase should not panic the MPC. “We still think that the impact of the recession and the vast amount of spare capacity created will eventually bear down strongly on underlying price pressures – the lags are often very long. As such, we expect the MPC to look through the rise in inflation and leave policy unchanged,” he said. 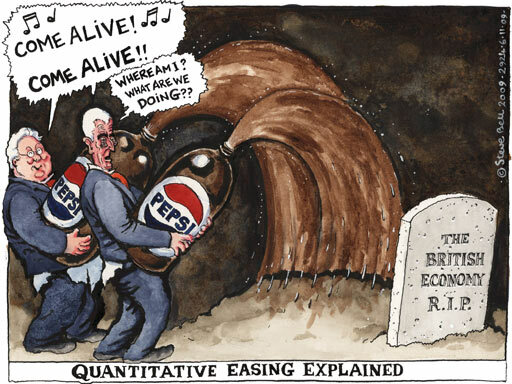 Interest rates have been on hold at the historic low of 0.5pc since March, at which point the MPC also began its unprecedented £200bn programme of quantitative easing (QE) – pumping new money into the economy through the purchase of Government bonds and other assets. The British Chambers of Commerce (BCC) argued that the higher-than-expected inflation rate did not justify a tightening of monetary policy, which could involve a rise in interest rates, a re-sale of some of the assets purchased by the Bank through QE, or a combination of both. “The UK economy is still weak, businesses continue to face serious problems, and there is ample spare capacity out there. With this in mind, it would be a major error to start tightening policy too soon. It is important to focus on steps aimed at allowing businesses to drive the economic recovery,” said David Kern, chief economist at the BCC.